2016 "Max Perkins discovered Ernest Hemingway and F. Scott Fitzgerald. But he never met anyone like Thomas Wolfe." Marsha Lederman Not nearly as smart as it should be. Adam Graham "Genius" deals with the creative ego, its trappings and the need everyone has for an editor. Tirdad Derakhshani Well-written, gorgeously shot, and expertly edited, the film is also an exasperating exercise in good intentions gone wrong. Richard Roeper Perhaps the best advertisement for Genius -- not only did it make me want to revisit Berg's book, it had me lining up the Wolfe, Fitzgerald and Hemingway on the e-book runway. Peter Howell Firth and Law falter with their characters' awkward bromance: the former a fatherly cipher (will he ever take off that fedora? ); the latter a clatter of drunken scribe clich�s. Tom Russo An intriguing study of the personalities and torturous process behind some of the early 20th century's great writing. Calvin Wilson Those interested in Wolfe and his enduring legacy would be better off reading one of his novels than seeing this film. 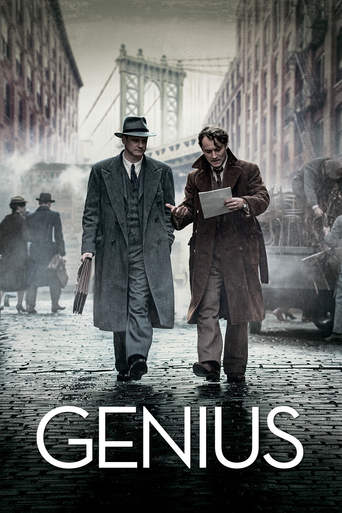 J. R. Jones Good editors strive to make themselves invisible, which is what makes this affectionate biopic of Maxwell Perkins-who guided Hemingway, Fitzgerald, and Thomas Wolfe into print-such an odd surprise. Liz Braun It's not bad, Genius, but it could have been great, and that's the disappointment.